It was easy to overlook the trade. Last November 20th, the Yankees shipped Caleb Smith and Garrett Cooper to the Marlins for international bonus money and unheralded pitching prospect Mike King. Smith and Cooper were spare parts and the Yankees needed to clear 40-man roster space for Rule 5 Draft eligible prospects, so they were traded for Shohei Ohtani money. The Yankees didn’t get Ohtani and that money went elsewhere. So it goes. As for King, a just turned 23-year-old from Rochester, he turned in a solid 2017 season after being a 12th round pick out of Boston College in 2016. He pitched to a 3.14 ERA (3.97 FIP) with a strong 55.7% ground ball rate in 149 innings last year, all at Low-A. Given his performance, it’s surprising the Marlins didn’t get King up to High-A at some point. Who knows, had they promoted him, they might not have been willing to trade him over the winter. The Yankees have done a very good job identifying quality second and third tier prospects in other organizations in recent years — Chad Green is the best example, but don’t forget Erik Swanson, Nick Green, and Juan Then — and King has joined the list. With one regular season start to go, King has a 1.87 ERA (2.80 FIP) with 24.4% strikeouts and 4.6% walks in 149.1 innings this year while climbing from High-A to Double-A to Triple-A. There are currently 450 pitches who’ve thrown 100+ innings in the minors this season and King has the fourth lowest ERA and the 14th lowest FIP. He struck out eleven in a three-hit shutout against a stacked New Hampshire (Blue Jays) team on June 30th, and, last time out, King took a no-hitter into the seventh inning. He’s rocketed up the ladder this season and performed exceptionally well. King went from unheralded to in-demand in a hurry. The Yankees have had a lot of success developing pitchers in recent years, specifically getting lower profile arms to take a big step forward in their development. Garrett Whitlock is one example. 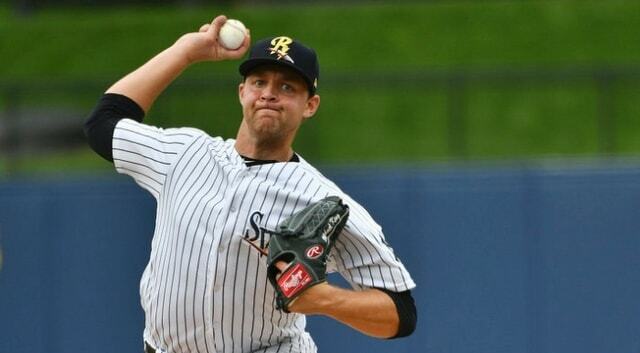 Taylor Widener and Chance Adams both went from college reliever to pro starter and broke out. Jordan Montgomery improved his stock after being a fourth rounder. Cody Carroll went from 22nd rounder to legit relief prospect. King is on a similar path now. When the Yankees acquired King, the scouting report didn’t jump out at you. “He uses a 92-96 mph sinking fastball to get plenty of ground balls, and pairs the pitch with a slider and changeup that are both still developing,” wrote Baseball America in their trade analysis in November. Meh. There are tons of dudes in the minors with a good fastball or sinker and iffy secondaries. Those are the types of guys who usually go in the 12th round like King. The slight increase in walks and slight decrease in ground balls since last year can be attributed to moving up the ladder. Double-A and Triple-A hitters are way better than Single-A kids. What stands out the most here is the big increase in strikeout rate. Going from 17.8% in Low-A to 24.4% across the three higher levels the next year is noteworthy. A young pitcher racking up that many more strikeouts against better competition demands attention. In all likelihood King’s improvement is not the result of one specific thing. It’s usually a combination of things. For starters, he has a full pro season under his belt now, and I’m sure that experience helps. The biggest change is the change in organizations. King went from the Marlins to the Yankees over the winter and the Yankees are pretty good at player development. They’ve earned the benefit of the doubt. They might’ve helped King make some adjustments that took him to the next level.
? In their midseason top 30 Yankees prospects list update, MLB.com says King “lacks a solid second pitch” and “his slider and changeup are decent offerings but unlikely to bother big league hitters,” which might very well be true. The slider in the video looks pretty good, but perhaps experienced big leagues will be better able to pick it up out of his hand. I see a pretty heavy sinker and a slider with out-pitch potential. Then again, I’m a dumb blogger, so maybe don’t listen to me. Anyway, we’re not going to see King in September. He’s had a great year and he’s reached Triple-A, but he won’t be Rule 5 Draft eligible until next offseason, and there’s no sense in committing a 40-man roster spot to a guy who a) is presumably approaching his innings limit, and b) won’t see much action in September anyway. Given his progress this year, King is a candidate to help the Yankees next season, possibly as early as April. That moving fastball and improved slider combined with pitching know-how has helped Peacock become an excellent swingman/multi-inning reliever. He’s thrown 189.1 innings with a 2.99 ERA (3.14 FIP) and 31.7% strikeouts since the start of last season. Without an improved changeup, I’m not sure King can get through a big league lineup multiple times. As a 2-3 inning reliever though? That might be the ticket. For now, there is no reason to take King out of a starting role, especially with the progress he’s made this year. Something has led to the increased strikeout rate. I don’t think it’s a fluke. Whatever it is, King has made strides this year, and he should be given every opportunity to make more strides going forward. Hell, Peacock didn’t figure it out until his age 29 season. These things can take time. The Smith/Cooper trade was all about Ohtani at the time it was made. Those guys were going to come off the 40-man roster anyway, and, rather than lose them for nothing, the Yankees used them to load up on international bonus money. King was the secondary piece. By no means is he a top prospect — I didn’t have him in my most recent top 30 Yankees prospect list — but he got better this year and he’s having success in Triple-A. That gives King a chance to help the Yankees early next year, less than two full years removed from a full season in Low-A.